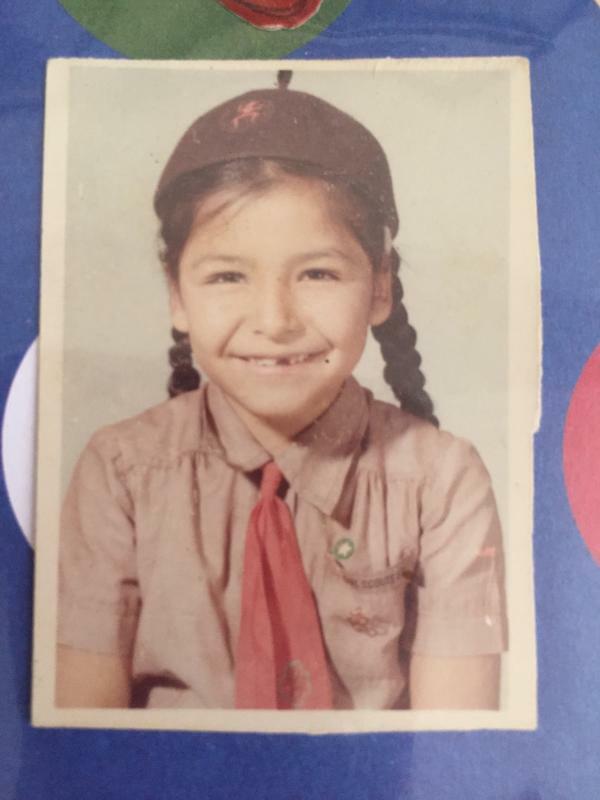 Sylvia Acevedo as a young girl scout. Sylvia Acevedo grew up on a dirt road in New Mexico. Her family was poor, living "paycheck to paycheck." After a meningitis outbreak in her Las Cruces neighborhood nearly killed her younger sister, her mother moved the family to a different neighborhood. At her new school, young Acevedo knew no one. Until a classmate convinced her to become a Brownie Girl Scout. And from that moment, she says, her life took on a new path. 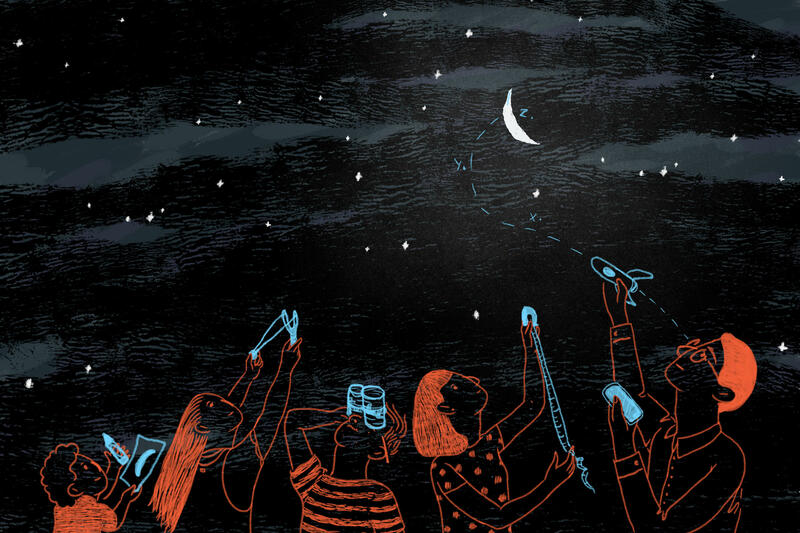 On one camping trip, Acevedo's troop leader saw her looking up at the stars. "I didn't know that there were planets," Acevedo remembers, "I didn't know there were constellations." Her troop leader pointed out the Big Dipper, the Little Dipper and a few planets. Later, when the girls were earning badges, Acevedo's leader remembered her fascination with the stars and suggested she try for her science badge. Acevedo writes about this pivotal moment in her new memoir, Path to the Stars. She went on to get a master's in engineering from Stanford University, then became a rocket scientist with NASA, and then, in 2016, was tapped to head the Girl Scouts. She was in Washington, D.C., recently, where I spoke with her about her new book and the relevance of Girl Scouts in an era of declining membership but also national concern about the education of girls. In the book, you talk a lot about perseverance. Can you give an example of something you overcame? I'll tell you about my high school counselor. When she looked at me she saw a female, but she saw a Hispanic girl. And so she said, "girls like you don't go to college." But you know what? Water off a duck's back! I showed her. So don't let anyone dissuade you with words. Don't let anyone say you don't belong. Don't let anyone do that. Being a rocket scientist was my dream, but everyone has their own dream. I hope girls read this book and get the message, you can live your dreams. Now that Boy Scouts have allowed girls, are Girl Scouts still relevant? Because it's a girl-only environment, it's safe. We know how girls learn and lead. We're the experts in that. The book is being published in Spanish and English. Why Spanish? In my family we spoke Spanish, so I wanted to make sure that girls from families that spoke Spanish would understand the advantages that Girl Scouts give them. When folks think of Girl Scouts, they often just think of cookies. You know we're incredibly proud of our cookie program. It really is the best entrepreneur program for girls and it's an amazing financial literacy program. I meet women constantly in the financial sector that told me they got their start through the great cookie program. So we're very proud of it. It allows us to be independent as well because the money stays local to drive girl projects and also their local councils. But you're right. You know a lot of folks don't know about our STEM [science, technology, engineering and math]. We are helping girls learn about cybersecurity, coding and programming. Did you sell cookies when you were a Girl Scout? I was there going door-to-door — to all my neighbors. I was really excited because we were able to make our goal and do all the fun activities. There's a famous sales technique that my troop leader gave me: She taught me that you never leave the side of a sale until you've heard "no" three times, and to this day I live by that. What it taught me was persistence, determination and resilience and I've kept that lesson in my life ever since. Thin Mints. I love opening a sleeve of Girl Scout cookies. It's like aroma therapy for me, just smelling that thin mint. I just feel calm. What are some things you're hoping to bring to the Girl Scouts? What does the future look like? Well, when girls are earning different badges they have all those job skills that are tied directly to what they've learned. So imagine, as you earn those badges, that a digital resume is created. So that when you're going to an employer that you're able to present your Girl Scout experience in a way that can get you hired. You've run your own business, you have made a budget, have great customer service. We're also really excited about re-imagining how girls represent their affiliation with Girl Scouts. So we don't even want to define ourselves by uniform. And right now there is a revolution going on in fashion and clothing and wearables. Imagine if we have technology embedded in a shirt. And when you came to another girl that was a Girl Scout that it would identify them. It's such a great time to be a Girl Scout. Now the story of a woman who went from Girl Scout Brownie to rocket scientist. She's also the current CEO of the Girl Scouts. Sylvia Acevedo has a new book out this week about her life called "Path To The Stars." It's written in both Spanish and English, and she spoke about it here in Washington with some of the Girl Scouts' young members. And they came prepared. NPR's Elissa Nadworny was there. UNIDENTIFIED PERSON #1: How did you become the CEO of Girl Scouts? UNIDENTIFIED PERSON #2: What were some struggles you faced working as a woman in a mostly male-dominated field? UNIDENTIFIED PERSON #3: What was your favorite part of being a rocket scientist? ELISSA NADWORNY, BYLINE: That last question - it's one of Sylvia Acevedo's favorites. She answers it like it's the best question she's ever been asked. SYLVIA ACEVEDO: You've got to wonder because your job was, like, looking at the universe and thinking as big of a thought as you could. NOVA: I'm Nova. I'm a senior in high school. And my question is, have you ever experienced discrimination for your ethnicity? NADWORNY: For that answer, Acevedo tells the story of her first meeting with her high school counselor. ACEVEDO: When she looked at me, she saw a female, but she saw, you know, a Hispanic girl. And so she said, girls like you don't go to college. But you know what? I showed her. You earn your seat at the table. And when you're there, don't let anyone say you don't belong there. Don't let anyone do that to you. NADWORNY: Sylvia Acevedo never did. She grew up on a dirt road in Las Cruces, N.M.
ACEVEDO: My family - we were - lived in poverty or near poverty. We lived paycheck to paycheck. ACEVEDO: My troop leader saw me looking at the stars. And I didn't know that there were planets. I didn't know that there were constellations. NADWORNY: Her troop leader pointed out the Big Dipper, then the Little Dipper. Young Sylvia was fascinated. ACEVEDO: Later when we were earning my badges, she remembered that. And she said, why don't you earn your science badge? NADWORNY: Acevedo says this experience hooked her on math and science in a big way. She went on to get her master's in engineering from Stanford, then became a rocket scientist with NASA. And two years ago, she was picked to head Girl Scouts. She looks around this room filled with Girl Scouts in vests and sashes filled with colorful badges. ACEVEDO: Girl Scouts helps give you those skills - that courage, that confidence. When people tell you you can't do it, you can. NADWORNY: Despite the excitement in this room, Girl Scouts' membership has been declining. Today there are 1.8 million girls, down about a million since 2003. And that comes at a time when the Boy Scouts are now letting girls join. But Acevedo says she's not worried about all that. ACEVEDO: We know how girls learn and lead. We're the experts in that. NADWORNY: She points to successful Girl Scouts who are now grown up - congresswomen, secretaries of state, astronauts, even Meghan Markle, who married into British royalty. I ask Acevedo about the perception that Girl Scouts is just about selling cookies. ACEVEDO: You know, we're incredibly proud of our cookie program. It has - really is the best entrepreneur program for girls, and it's an amazing financial literacy program. NADWORNY: But it's much more than cookies, she says. In the last few years, they've awarded more science and math badges than in the entire history of the organization. ACEVEDO: We are helping girls learn about cybersecurity. We're helping them learn about coding, programming. NADWORNY: It's part of their push to reach more girls and remain relevant. That's one of the reasons Acevedo published her new memoir in English and Spanish. ACEVEDO: I wanted to make sure that girls whose families spoke Spanish would be able to understand the advantages that Girl Scouts gives them. NADWORNY: After the Q&A, a young girl named Amanda Santiago wants a photo with Acevedo. AMANDA SANTIAGO: You inspire me. ACEVEDO: Oh, thank you. Well, you inspire me. This is why I do my job - because of you. NADWORNY: Amanda is a junior Girl Scout who dreams of becoming an astronaut. Acevedo, she says, is her hero. AMANDA: I like that she broke barriers and proved to people that girls can do anything. NADWORNY: Amanda says she'll be thinking about this moment when she starts her next series of badges about energy and recycling. Elissa Nadworny, NPR News. (SOUNDBITE OF MICHAEL GIACCHINO'S "UP WITH END CREDITS") Transcript provided by NPR, Copyright NPR.